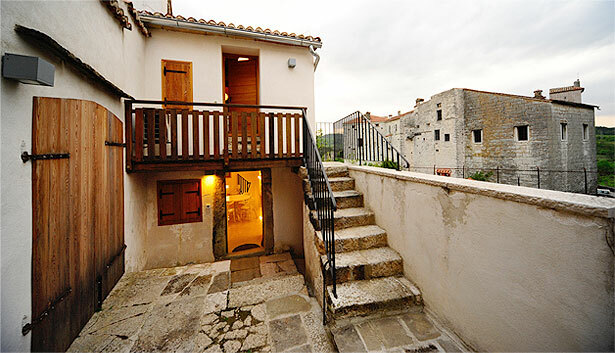 The Writer’s House is a new cultural institution of Pazin but also of Istria. The formation of the House has put the organisational foundation allowing future development of new models and modalities of literary life in Istria and Croatia. This is an essential step forward in the development of the “infrastructure” of the Croatian literary space, but what’s more, it represents the opening of this space to international cooperation and dialogue. The House is located at Buraj, the historical part of the town which has been protected as a cultural monument. The attraction of this position is emphasized by the closeness of the medieval Castle and the Pazin Gorge right beneath it. A ruinous building owned by the Town of Pazin was renovated by investing joint funds of the Region of Istria and the Town of Pazin. Works on the House commenced in 2007 and were completed in November 2009 when the opening ceremony took place. It consists of the ground floor which is a public space (literary evenings, lectures and similar) and a studio flat on the first floor intended for accommodation of guests. On the occasion of the opening ceremony the House hosted the writer Robert Perišić who was the guest on the first literary evening. After him the House hosted Maja Vidmar, Zoltán Medve, Milan Rakovac, Renato Baretić, Olja Savičević Ivančević, Sanja Lovrenčić and others. Ever since its opening, the Writers’ House has been intended to entertain people dedicated to literary work in general, from authors, prosaists, poets and playwrights to translators, theoreticians, literary historians, publicists or literary scientists. The Work Programme provides for visits of more recent names, known to the Croatian public, to attract the audience to their public reading or conversations. The objective is to host also less known but prized writers. It must be emphasized that the intention is to open the Writers’ House Work Programme to authors coming from the wider region, the Balkans, the Mediterranean and Central Europe, joining in this way the city of literature network. Scholarship programmes are intended to host foreign authors, but also to encourage Croatian authors to participate in similar programmes and projects in the region.